We were sitting in the Spoon. That’s the Runcible Spoon, back there in Bloomington, Indiana. We were playing with the idea of our own cafe on the Internet for stories, the kind of place that inspired us the way this woody warm coffee house did. We had an idea what we wanted. We were looking for a kind of warmth and gentleness and spunkiness. We were thinking about names. We considered Karass, Kurt Vonnegut’s name for a circle of people who revolve around each other knowingly or unknowingly. But we thought it would never move from under the dark and looming shadow of Vonnegut. We considered a bunch of things, none too good. She thought it should be a deeply thoughtful place. The kind of place you might go to write a story or go to hear a poetry reading. She’s been in Bloomington for 17 years, and the Runcible Spoon has been a part of her life since college. I envisioned something slightly different, a roadside cafe where strangers meet and talk and get to know each other. I’ve traveled throughout the west and roadside restaurants and bars are a part of my growing up, the places where I’ve met the nicest, most interesting people. The metaphor of the cafe was a natural one. It is the place where we come together to do our own things, read or write, or tell stories, or visit, a place that was warm and social. 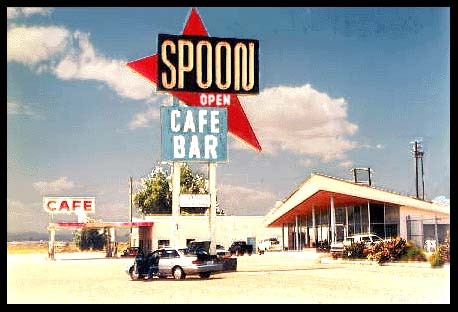 I think she hit on the name Spoon. Yes, Spoon. Like the Spoon here in town or like a greasy spoon out along the information highway. Everyone would bring their vision of what it was and what it could be. A lively joint with a jukebox. 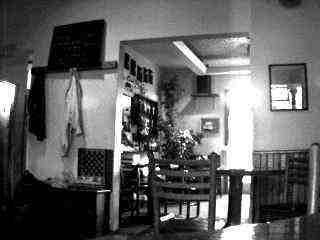 A quiet wood-paneled coffee house in which to share intimate thoughts. A restaurant in which we sat around a big table swapping lies. I wanted it to attract a bunch of different people. Old fogies and young fogies. Wild storytellers and tame domestic ones. People with adventures to tell and people with everyday lives to share. I wanted lies and truth and stuff that fell in between. I wanted dabblers in eros and experimenters in life. We wanted people who were weird and people who were normal, people who couldn’t be pigeon-holed, a collection of non-joiners and misfits. It was born of love and joy, the Spoon was. This entry was written by Wes Modes, posted on August 18, 2008 at 9:00 am, filed under The Spoon and tagged beginnings, genesis, origins, thespoon. Bookmark the permalink. Follow any comments here with the RSS feed for this post. Post a comment or leave a trackback: Trackback URL.